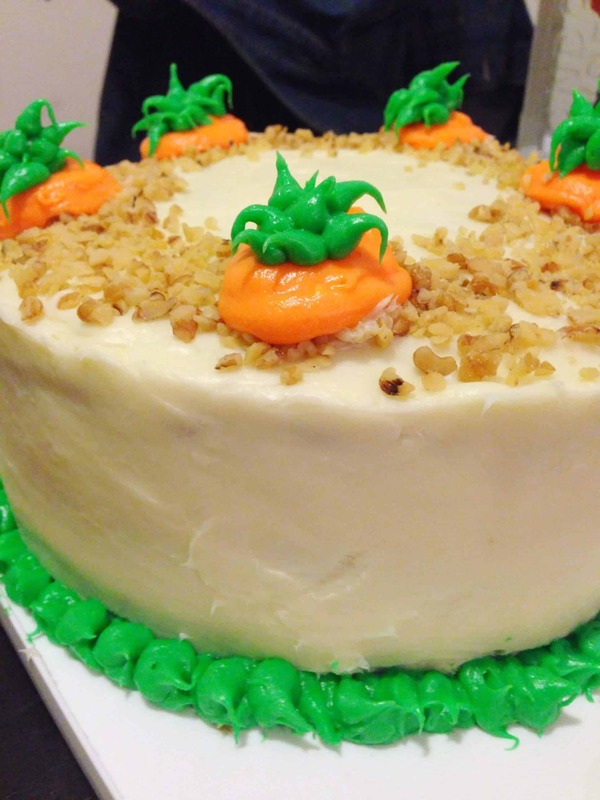 I have a go-to, traditional southern carrot cake recipe that I would stake my life on. It’s moist, has great texture, and has a wonderful balance of flavors. But there are only so many times a girl can make the same recipe in a month! 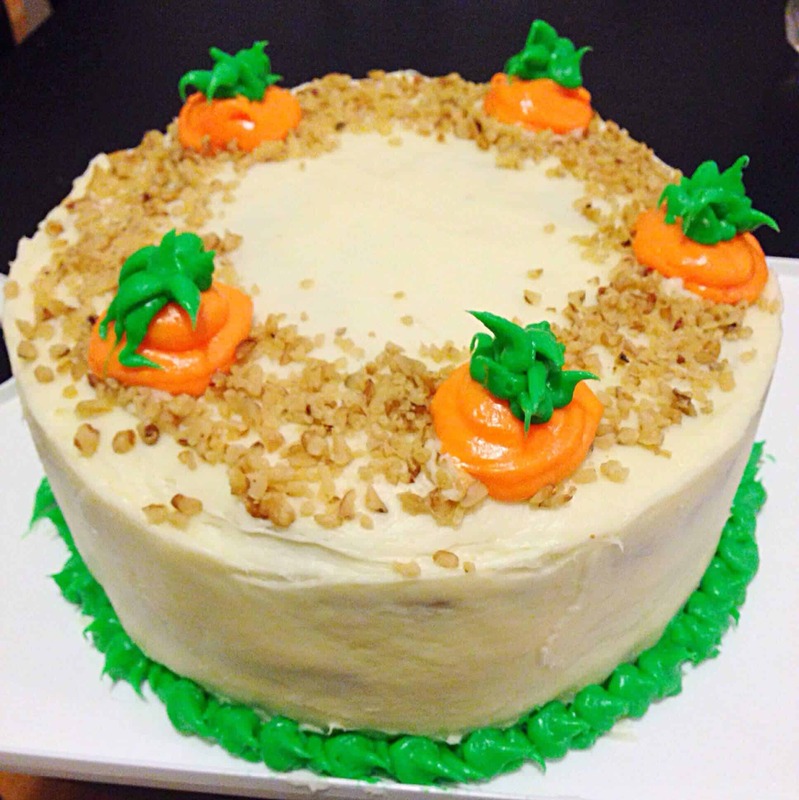 This is the third request I’ve gotten for carrot cake, and I needed to mix things up. I decided to spice up my favorite recipe. I experimented with a little cayenne, and made a spicy carrot cake with a bourbon maple cream cheese frosting. Preheat oven to 350 degrees Fahrenheit. Line and lightly greasing three nine-inch, round, cake pans. Set the pans aside. Stir together flour, baking soda, salt, cayenne, and cinnamon. Mix in the eggs, sugar, oil, buttermilk, and vanilla at a medium speed, until fully incorporated. Fold in the carrots, pineapple, coconut, and walnuts. Pour the batter evenly between to prepare cake pans, and bake for 30 minutes, or until a wooden pick inserted in center comes out clean. Allow the layers to cool for 10 minutes in the pan, then carefully remove them to allow them to finish cooling on a wire rack. While the cake layers cool, prepare the cream cheese frosting. Beat the butter and cream cheese, until the mixture becomes light and fluffy (about 2 minutes), then mix in the powdered sugar in several installments on a low speed. Add in a splash of cream and bourbon between the powdered sugar installments. Add in maple syrup and salt last, and mix on a low speed until fully incorporated. Once the cake layers are fully cooled, frost each layer with an even layer of frosting, and add a thin crumb coat around the cake. Chill the cake in the freezer for 10 minutes, until the crumb coat is firm to the touch. Add a second, thicker layer of frosting, and smooth using a bench scrapper. Then decorate as desired! 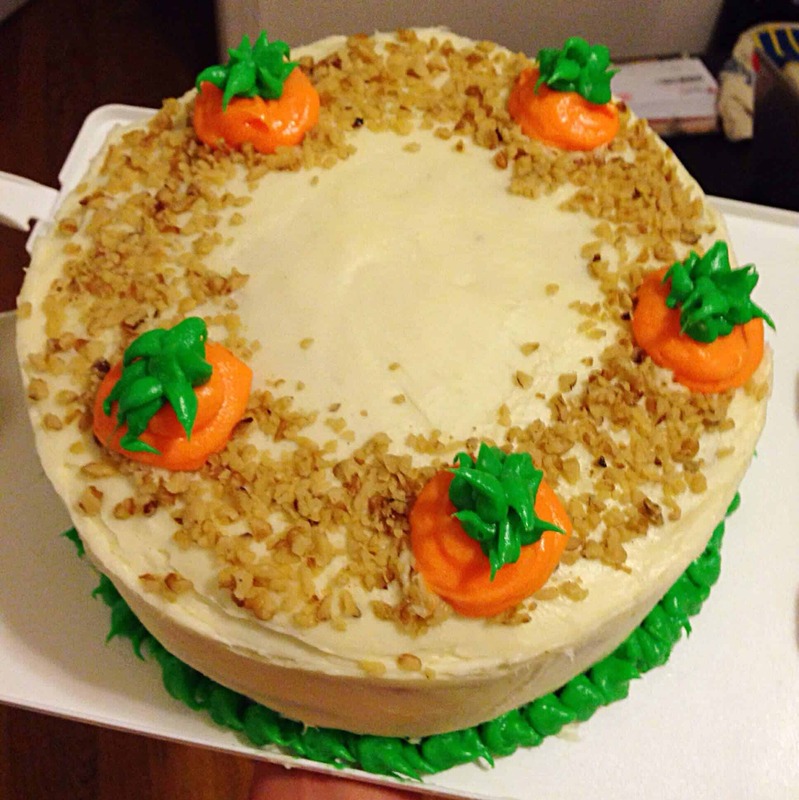 I opted to make a walnut dirt garden, with orange and green gel colored, frosting carrot tops. Hi! Trying this recipe now, but a big confused – you have it described as both a cake and cupcakes, and refer to two types of frosting but don’t talk about how you used each of them. Will you clarify? Thanks! wow not sure what happened there! it’s updated now, so sorry about that!! !